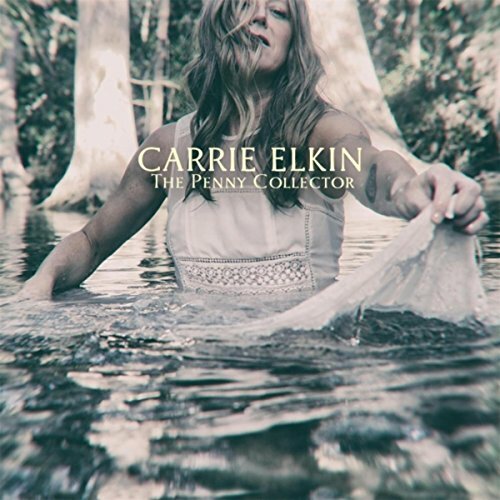 Carrie Elkin has a fascinating voice. Earnest, yet powerful, with a sense of longing to her vocal and a purity which adds gravity to her emotive lyrics. Legendary Radio 2 DJ Bob Harris has compared her spellbinding performance to Patty Griffin, Iris DeMent, and Nanci Griffith, no less. Her vocal style shares similarities with Sheryl Crow, Carole King, Karen Carpenter, Joan Armatrading and Marie Fredriksson of Roxette. There is also elements of First Aid Kit to be found here - albeit solo voice with male harmonies. Carrie’s debut album “Simplicity” was released in 1996 and she has never looked back. She received glowing reviews for her 2007 LP, “Jeopardy of Circumstance” and toured the UK and the US as well as recording on her partner, Danny Schmidt’s, albums. “Call It My Garden”, recorded for award winning folk label Red House Records in 2011, gained widespread acclaim and “For Keeps” followed in 2014. “Penny Collector” is a collection of songs which inhabits the musical realm of Americana/Roots, Folk and Indie Rock. It is her sixth solo album and arrives in the wake of much critical praise and admiration for her previous recordings. The album opener, ‘New Mexico’, conjures up images of a barmy and humid lightning storm, with rolling thunder and torrential rain to come. The opening feels conclusive; indeed it could easily be imagined playing over the closing credits of a Tarantino movie. The gentle, ethereal harmonies serve as a warning rather than a comfort “This is where the wreckage lies; this is where I first came alive…” Elkin’s vocal crescendos midway through, echoing this warning “I’ll pray to St. Jerome that my wings won’t fail me now”. The bass drum acts as a heartbeat running through the song - a pulse of expectation of what is to come as the track echoes to a close. ‘Always on the Run’ opens with choppy strumming; an ode to a drifter or drifting. The vocal harmonies soar and emulate a sense of longing for freedom and escape. The lyric is both brooding and dark; “His wife is in bed and it’s late, and he’ll lay beside her but he won’t touch her, He thinks she’s sleeping, but she lies there awake.” There is a long awaited release and hope of a new beginning “And the moon starts to fall, and the sun starts to rise, and they meet in the middle for that breathe in the sky.” The song reflects on the destruction of Native American land “The reservation down there, Is rough and it’s dirty. The trees have been cleared, and the cattle are dead. ” and the relentlessness of pioneer life “And he opens his eyes says the work is never done. And he calls for his wife but she’s always on the run.” Desperation with an unquelled desire for change. ‘Albatross’ holds similar values but has a more optimistic outlook on the future. “Albatross gonna make me sing, with my mother’s voice and my father’s wings.” A sense of valuing the past while looking to the future. The guitar melody, plucked by the unmistakable hand of Will Kimbrough, sounds as if it could be being played while sat round a campfire at night. The simple melody and close harmonies are punctuated by the bass drum. There are similar themes here of expectation, life decisions and new beginnings. The lyric suggests feelings have been simmering and are poised to break out, evident as the harmonies swell mid song “We’re resilient though I guess, time will do the rest.” The close of distorted guitars drifts away like fireflies in the stars of the night sky. The dreamlike conclusion segues seamlessly into ‘And Then the Birds came’ which has a similar narrative and themes of reflection and is a final prayer and goodbye to her late father. ‘Crying Out’ is a standout track and a hallmark of the album. The finger-picking introduction is as intimate as the lyrics that follow which address intimacy at night, desired, yet missing. It is a lullaby which reflects on how slumber and companionship offer a cocoon from the world outside. In the mid section of the song beautiful strings rise behind the leading riff and are later accompanied by harmonies reflecting longing and unrequited love, or the end of an affair “But I’m lonely now, I know it’s hard for you, I know you know what to do, but I know it’s hard for you”. It is a sweeter, if no less painful, take on the territory explored in Alanis Morrisette’s notorious hidden acapella track ‘Your House’ found on the album “Jagged Little Pill”. There is similar longing and exploration of the loss of love which is no longer reciprocated or felt. ‘Live Wire’ follows, providing an upbeat contrast. It is a dancefloor and festival friendly track with an intoxicating bass drum beat and ‘Mumford and Sons’ rhythms. An unapologetically optimistic anthem to embracing life, whatever it throws at you and to carving your own niche. “She climbed through windows. She sailed through school. She swung both ways, just to break the rules.” It is easy to imagine fans at her concerts singing at the top of their voices with arms held high. ‘Tilt-A-Whirl’ has an opening Hammond organ whirl which wouldn’t be out of place on a track by French band Air. The track is a heartfelt ode to fond memories of treasured times that exist before life gets complicated “We were young then, we were brave then…” Listening to the song is like looking through photos of happy days of joy and exciting and uncertain beginnings “And although we cried some, we would still fly some, we would still fall some, but we weren’t afraid.” The lyrics are reaching for, and a celebration of, the intangible energy of youth. ‘Niagara’ arrives with sustained opening chords, like a rising sun on a new morning. The slide guitar calls in an almost whale like song through the gently lapping melody. ‘Niagara’ is a heartfelt and hauntingly beautiful song of storytelling “Back when she was a girl, she’d visit Niagara, it was the top of the world, and she’d dream of diving straight over the falls…” Graceful harmonies and soothing rhythms create an intoxicating, fragile and dreamlike song. It is another standout track, which will find many listeners reaching for the repeat button again and again. Elkin’s take on Paul Simons ‘American Tune’, the penultimate track, has a vocal so crystal clear that Karen Carpenter could have been responsible for it. Elkin brings a sustained intimacy to the track which is purely guitar and vocals for the first two and a half minutes of the song. This stripped back approach gives the gentle strings real impact when they arrive. ‘Lamp of the Body’ is a brooding closer with the counter melody “This little light of mine”. As with the opening track this also points to what is yet to come; the potential of the future and building on, savouring, but not dwelling on the past. Carrie Elkin is totally in control of her craft. Quality seeps from every track on “The Penny Collector” and it is as lyrically challenging as it is captivating. Producer Neil Hubbard beautifully captures the power of the ‘fierce yet fragile voice’ of Elkin on the album and he does so without losing the delicacy and nuance. This is real storytelling of heartbreaking purity and genuine passion and experience. The title was chosen in honour of her late father, Richard Elkin, who was a keen penny collector. As Elkin states in the liner notes “...in his lifetime he had collected approximately 600,000 special little pennies... [he found] value and delight in the tiny things that other people might walk right past.” The album is reflective of this and, as such, is a breath of fresh air: While immediately comfortable listening it has such depth it warrants, nay demands, many repeat listens. In doing so, the listener will be richly rewarded in discovering the “tiny things” and intricacies that lie within.